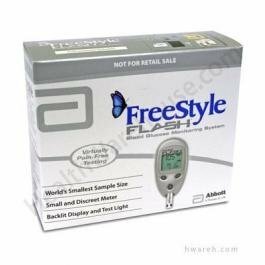 The Flash Freestyle Meter is my favorite, and what I personally use. Having had diabetes since 1980, I can vividly remember the time in which blood testing didn’t even exist. The only way I could monitor how much glucose was in my blood was by examining how much had spilled over into my urine over the past several hours. At just seven years old, I peed into a cup 2-4 times per day, put a dropper full of it into a test tube along with this little chemical tablet, and then watched it fizz into a joyful, deep blue color when my sugar level was normal, or into a depressing orange color if is was too high. So think about that…there was no way to ever really know what the blood glucose level was at any particular moment. Thus every test was only an average of what the blood glucose had been over the past several hours. Challenging for ideal control, to say the least! Thank goodness for the invention of home glucose monitoring! Even though the first blood test strips took two minutes to present the result (which was manually read comparing the colored strip to a color chart), I was thrilled to no longer have to deal with peeing in a cup (especially when spending the night at friends’ houses!). Eventually, meters were introduced and my first one was about the size of a VHS tape. Of course, over the years they have become smaller and faster. And now, finally, I think I’ve discovered my favorite meter of them all: the Freestyle Flash. There is a dizzying array of meter choices out there, so I certainly have not tried them all; but let me tell you why I like this one so much. It’s small so it easily fits into my tiny diabetes supply bag that I carry with me wherever I go, or even in the tiny pocket of my running pants when I go for a jog. The result appears in 2-3 seconds. It uses the tiniest amount of blood of any meter I have ever tried. But the thing that makes it stand out to me as my favorite of all is something so simple but sooooo convenient: it has a light! After years of struggling to test my blood sugar in the dark at a movie theater, driving in a car at night, or in bed in the middle of the night (or countless other places when the light is dim), I am overjoyed that a meter company finally has taken the time to think about how they could take that extra step in helping make our lives easier. I cannot tell you how wonderful this simple extra feature is! As soon as the strip is inserted, a little light illuminates the strip (so wonderful…thus even in poor light, I know exactly where to add my drop of blood), and then as soon as the adequate amount of blood has been taken into the strip, the light on the strip turns out (thus clearly telling me that I can confidently take my finger away), and then the screen lights up, thus easily allowing me to see my results!! I LOVE this meter! Thank you, Abbott, for going the extra mile in realizing how valuable this ‘little’ extra feature is! After being diagnosed with Type I diabetes at the age of seven, Dr. Jody Stanislaw has grown a special interest in diabetes and helping others live a healthy and vibrant life. If you have any further questions about diabetes you are welcome to leave them in the comments section. Great history of the blood glucose monitor…sheesh it is crazy that not too long ago you had to test your urine like that. If not almost barbaric. Who knows what your numbers every really were? Thank goodness we have more reliable testing strips, and testing measures like HgbA1C to follow. I do have to add my tip here…always bring your monitor with you when you get glucose labs drawn, that is one of the simplest ways to consistently “calibrate” your machine and insure that the machine is not running too high or too low or in need of replacement. Test your glucose with your monitor right before your blood draw and circle that number and make a note like “lab draw day”….if the two numbers are relatively close then you can feel confident your meter does not need to be replaced. I hate my monitor so thanks for the advice. I have thought it was unreliable for quite some time. I will go out today and get this! Thanks Dr. Jody, I like the advice coming from a fellow diabetic. Since I have Type II diabetes but don’t take insulin what would you recommend for me to do when my sugar is high? I take glucophage 500 mg twice daily, but other than that don’t take anything. This is my favorite too, and it’s also a great deal for people who may not have insurance coverage. Only about $25 for the meter and +- $60 for 100 test strips. Thanks for getting us a diabetes expert Dr. Nicole it is so complicated to sort all this out and I feel better getting the advice from a fellow diabetic. I love Kitchen Table Medicine! Thanks Dr. Jody….Wow this site is so useful. I just forwarded this article to my family and friends with diabetes. I think they should be checking their blood sugar more than once a day and agreed with your last article. They are not healthy at all and I just want them to have the best information possible. I don’t understand why their doctors aren’t prescribing glucose strips for three times a day? Does insurance not cover that Dr. Jody? Sonya, I wish I could simply say ‘yes’ to your question about whether insurance covers blood glucose strips….But the answer is different for everyone depending on what kind of insurance and what level of insurance your family and friends have. But if their doctors are not telling them to test at least three times a day, sounds like they need a new doctor….this is the most basic suggestion for every diabetic. It can empower them to realize that when their numbers are good, they’ll likely feel a whole heck of a lot better, thus more motivated to do what they need to do to keep their sugar level in the normal range. Speaking of, to answer your question Robert S, the quickest way to get your sugar level to return to normal is to get up and move your body! Even just get outside and walk around the block a few times…it doesnt have to be a big deal. Go walk up and down some stair for 5 minutes….just move…and you’ll soon feel a whole heck of a lot better too. Make it a "Gym Date"